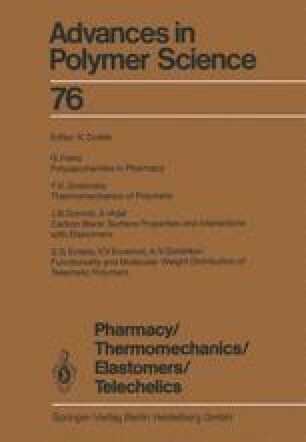 This article reviews recent developments in polymer thermomechanics both in theory and experiment. The first section is concerned with theories of thermomechanics of polymers both in rubbery and solid (glassy and crystalline) states with special emphasis on relationships following from the thermomechanical equations of state. In the second section, some of the methods of thermomechanical measurements are briefly described. The third section deals with the thermomechanics of molecular networks and rubberlike materials including such technically important materials as filled rubbers and block and graft copolymers. Some recent data on thermomechanical behaviour of bioelastomers are also described. In the fourth section, thermomechanics of solid polymers both in undrawn and drawn states are discussed with a special focus on the molecular and structural interpretation of thermomechanical experiments. The concluding remarks stress the progress in the understanding of the thermomechanical properties of polymers.